Last summer I discovered Google Drawings along with the vast uses for supporting education. Recently I’ve noticed how the Google Drawing APP is integrated into some of the other core components within a Google APPS for Education Account. This past week I had the opportunity to explore using the Google Drawings integrated within a Google Document. This tool unleashes the power to create original clipart, charts, graphic organizers, meme’s and etc… within a Google Document. This is done by layering both image files, shapes and a few other detailed steps to have the drawing image positioned properly in a Google Document. Provides visual support to help the student complete assignments. Students can express ideas in a picture along with words. Provides an interactive manipulative for problem solving built into the Google Document. Mind map support for writing. Student may move Mind map throughout document. Provides an area to do computation within the document. Student creates a Meme positioned at top of document. Student then types or voice types explaining their inspiration for creating the Meme. Poetry layered on a graphic background. An opening paragraph layered upon representative illustration. 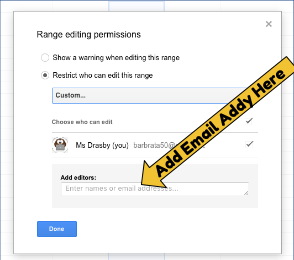 There is too Many Google Drawing Support ideas to share in one blog post list. It is an interactive way to support writing! Watch Here to LEARN More!!! Over the summer I posted about using Google Slides for Categorizing YouTube Videos. I never thought about the “BIG” impact this simple idea can make upon the classroom. Recently I embedded a bunch of YouTube links into a Google Slides Presentation. The YouTube videos are used by a Teacher Partner for reinforcing content presented in the classroom. After sharing the slide with the teacher I was asked, “Can this presentation be shared with the students.” My response was, “Absolutely!” This is when i realized the Youtube slide deck can be a categorized study support for students. I’m developing a new Google Sheets interactive lesson to use with my students. One of the potential issues I for-see is students typing on another student’s sheet. This got my brain rolling and the solution I came up with was to use the Protect Range tool. When you protect a cell or column ranges only the user selected can edit the area. 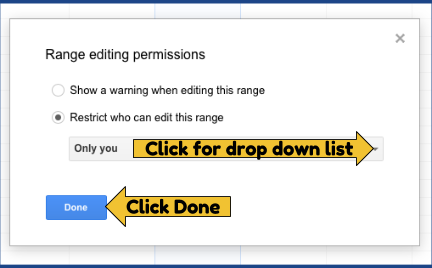 The Google Spreadsheet is shared at once to a group with each sheet having different editing rights. Individual student’s names will appear on the tab for each sheet. One sheet per student. This will help guide the students to the sheet where they have editing rights.